Sanford firefighters line up to get their heads shaved in solidarity with an assistant chief who was diagnosed with brain cancer. The Sanford Fire Department is showing solidarity with their assistant chief, who has been diagnosed with brain cancer. The standard haircut at the Sanford Fire Department for the next few weeks will be little or no hair. The chief says it’s a gesture to keep spirits high for their assistant chief. Chief Steve Benotti is raising spirits of Assistant Chief Steve Cutter, after he was diagnosed and started treatment for brain cancer in November. Benotti shaved his head Sunday, and the department took the hint. 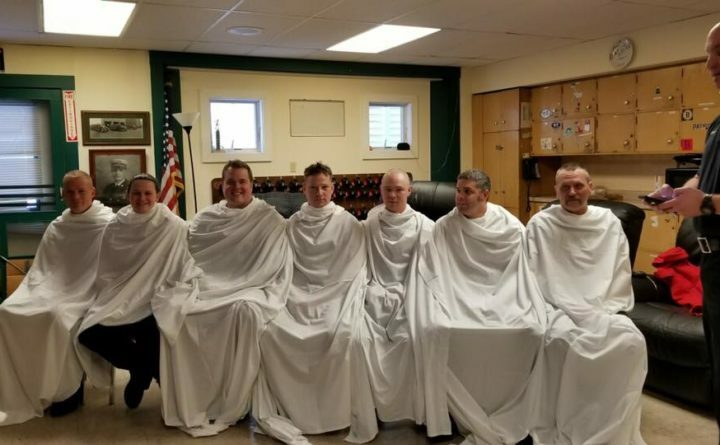 “Assistant Chief Watkins, who has stepped into Steve’s place while he’s out sick, had had six people lined up in chairs with sheets over their shoulders and he had the shears in his hands and they had all stepped up to get their heads shaved as well,” Benotti said. Benotti sent pictures to Cutter, who told them he was touched. Benotti says firefighters know cancer is a job risk. It even afflicted the department’s dog, named Chief. “(The dog) was diagnosed two years ago with a cancerous tumor on a valve on his heart,” Benotti said. Chief got treatment to shrink it to manageable size. The department hopes similar happens for Cutter, and they keep working to reduce the chances of cancer, protective hoods and washing gear, standard practice, but risks are everywhere. “The diesel exhaust hoses, those are here to help keep the diesel emissions out of the station as well,” Benotti said. Benotti says other retirees have also been diagnosed, but right now, their hearts and minds are with Steve Cutter. “Steve is part of our vibe; part of what makes this place tick every day,” Benotti said.